For 18 weeks, I focused on one number: 3:10. Whatever my actual pace was on easy, tempo, and long runs, three hours and ten minutes was always in the back of my mind. I’d targeted that goal twice before, instead running 3:13s both times. Lincoln was going to be my race, the one where I finally broke that barrier. I didn’t. In fact, I didn’t even come close. Unlike the past two races, though, I’m not beating myself up about it. Sometimes, the weather is challenging. Sometimes, race day is not your day. And last Sunday was definitely not my day. 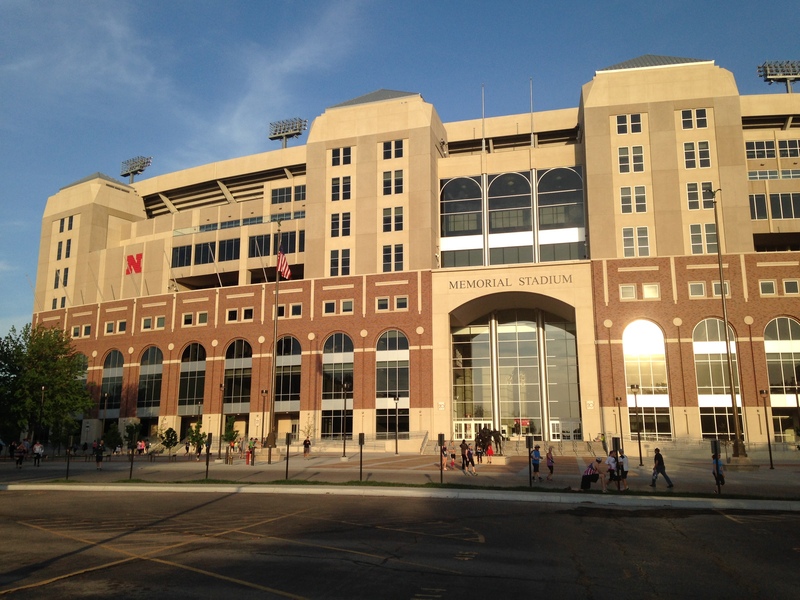 We left home a little after 7:00 on Saturday morning and drove the six-ish hours to Lincoln. Jordan deserves the Husband of the Year award — he’d spent Wednesday through Friday in the mountains with sixth-graders, then got up early Saturday to drive me to Lincoln, got up early again on Sunday to watch me run, and then drove me home. He’s a winner. Our first stop in Lincoln was the expo. It was really crowded, so we didn’t stay long. Instead, we checked in to our hotel and I went for a short shakeout run, then stretched and Sticked to work out the stiffness from the car ride. We grabbed some pasta from Noodles and Company, then just relaxed in the room and went to sleep early. I slept surprisingly well for the night before a race, waking up just before my alarm went off at 4, when I ate my bagel with PB, popped some Immodium, then crawled back into bed for a while. Finally, we got up, got ready, and headed to the start line. 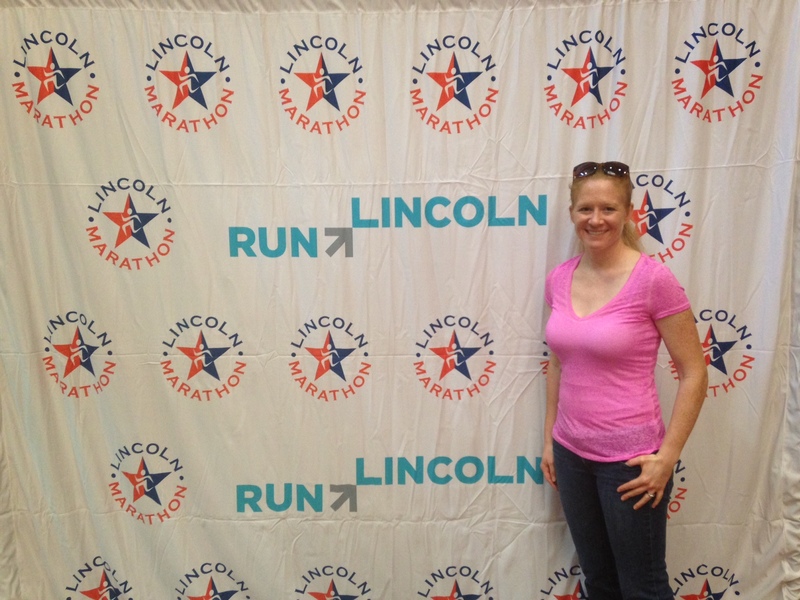 Lincoln knows how to start a race: there was a huge indoor space to wait in (which wasn’t necessary, since it was already 60 degrees, but it would’ve been really nice in colder weather), and approximately 12 million porta-johns, to which my nervous bladder sent me several times. Finally, it was time to find my corral and get ready. 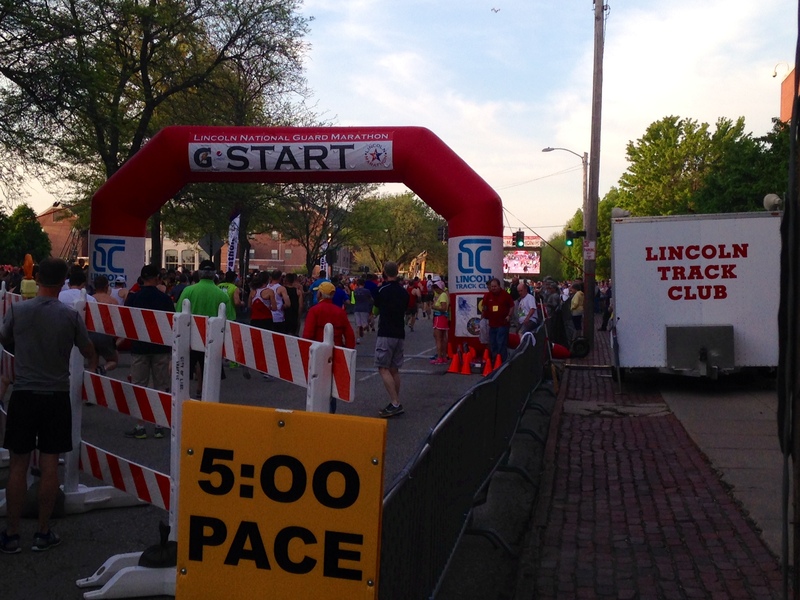 Lincoln’s corrals are sorted by bib color, which makes it easy to find the right spot. As I lined up, I saw the 3:13 pacer and told J, “I’ve got to beat that guy!” (Spoiler alert: I didn’t). The National Anthem played, the wheelchair racers started, and then — BOOM — we were off! The first few miles ticked along right on pace, but the weather was heating up and getting humid fast. By mile 5, my tank top was already getting soggy, and I was getting nervous, though I was still on pace. By mile 10, the sun came out in full force, I was sweating hard, and my pace started to drop from 7:15s so 7:25s or so. At that point, I knew that my 3:10 goal wasn’t going to be realistic. Miles 7-12 were mentally challenging, as the half-marathoners were starting their negative splits, and I was getting passed like crazy. Since so many more people run the half, a lot of the spectators were shouting things like, “You’ve got this! 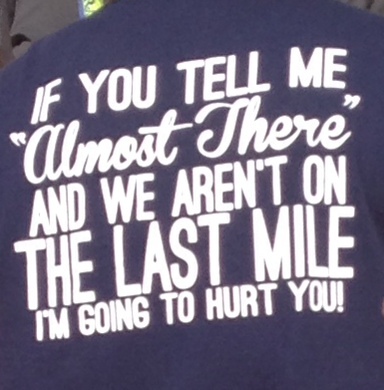 Just two more miles!” It made me laugh… and also really tempted me to turn right, toward the finish, at the split. But I knew I’d never forgive myself if I didn’t finish the full, so I turned left, leaving the half crowd behind. J saw a woman wearing this shirt and took a picture for me. He knows me well. The second half of the race had much less shade, and my pace started dropping significantly. I was seeing eights on my watch, which I didn’t like, but if I crossed a certain speed threshold, I’d get lightheaded and nauseous, so the slower, safer speed won. At about mile 15, a little twig wedged itself down into my shoe. I had to stop and take my shoe completely off. I was not thrilled with losing even more time, but there was no way I could run another 11 miles with that thing rubbing my foot. J caught me shortly after mile 15, and I made a “shoot me now” gesture. The heat and humidity was dragging me down — training through the winter certainly didn’t prepare me for it — and a headwind was blowing to boot, but he cheered me forward. At this point, my pace was shot, so I simply focused on moving forward, breaking the race into 2.5ish-mile segments — from aid station to aid station. At each stop, I chugged at least two cups of water and often dumped one on my head, too. Several aid stations and friendly spectators also handed out cups of ice, which I’d dump down my bra for a few minutes of sweet relief. I probably should have been drinking Gatorade — I’m sure my electrolytes were way off; my body was gritty with salt by the end — but since I hadn’t trained with it (thanks to that strict diet), I didn’t want to race with it. I’m not sure which was the worse decision — risking it and having it destroy my stomach, or skipping it and getting more and more dehydrated. I did take three Vfuel gels, the last one at mile 17 or so (I think). I carried five, planning to take one every 45 minutes, but after a while, I just couldn’t stomach them in the heat. I finally hit the turnaround just before mile 20, expecting to get some relief from the wind. Nope — it shifted, too. I thought that shift was all in my head, but several other runners said the same thing. I read an interview with the women’s winner, and she even said so! That made me feel like less of a baby. The last 10k was a slog — I had to stop and walk several times to keep from blacking out, and I continued my chug-dump-ice routine at the aid stations. At least everyone else was struggling, too, so we cheered each other on as we leapfrogged. One nice guy even offered me water from his Fuel Belt when I was hurting. That’s the best thing about this sport — sure, we’re there to compete, but everyone looks out for one another, and I love the camaraderie. Finally, I turned the corner into the stadium and toward the finish line, which was at the football field’s 50-yard line. That tunnel seemed to go on for-ev-er, but I really appreciated that the half and full marathon were split all the way to the finish. Dodging walkers at the end of a marathon is rough, so I liked that we had separate paths. 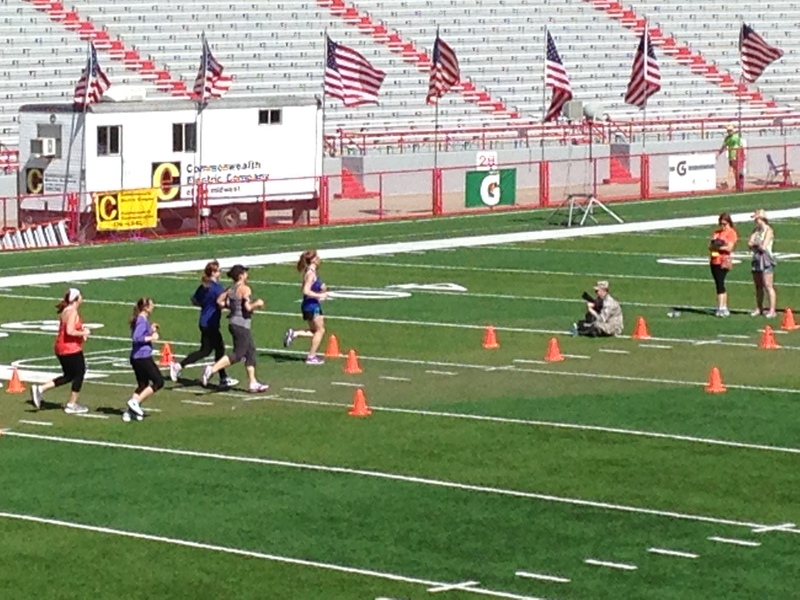 I also loved that they announced each marathon finisher over the loudspeaker in the stadium. I felt like big stuff. When I was finally close enough to see the clock, I saw 3:27, and gave it what little kick was left in my legs. It looks like I’m passing all those chicks, but they’re in the half lane. The race sent a finisher video, but I’m not smart enough to embed it. If you want to see what a 90%-dead redhead looks like, click here. Once I crossed the line, I stopped to catch my breath and wait for the world to stop spinning, hobbled back into the shade under the stadium and grabbed some Gatorade and water, then shuffled back out to the stadium turf. I wasn’t sure where J was, and I didn’t think nonrunners were even allowed where I was, but I desperately needed to sit down, as I was pretty dizzy. I eased myself onto the turf, rested my head on my knees, and drank my water and Gatorade. I even managed to choke down some chocolate milk. After a while, I felt okay enough to try to find J… but I couldn’t get up. I had to ask a stranger to help me. Ouch. I finally found J, and then found the showers (another perk of this race: not having to stink afterward). Then, we found my favorite post-race lunch: a burger, a beer, and sweet potato fries. It was everything I wanted. My official time was 3:27:14 — my third-slowest marathon, and far slower than the 3:10 I originally hoped for. I was disappointed, sure, but I honestly feel that there’s nothing I could have done differently. I’m not a good heat runner anyway, and I didn’t have any opportunities to train for those conditions, since the last 18 weeks were, you know, winter. 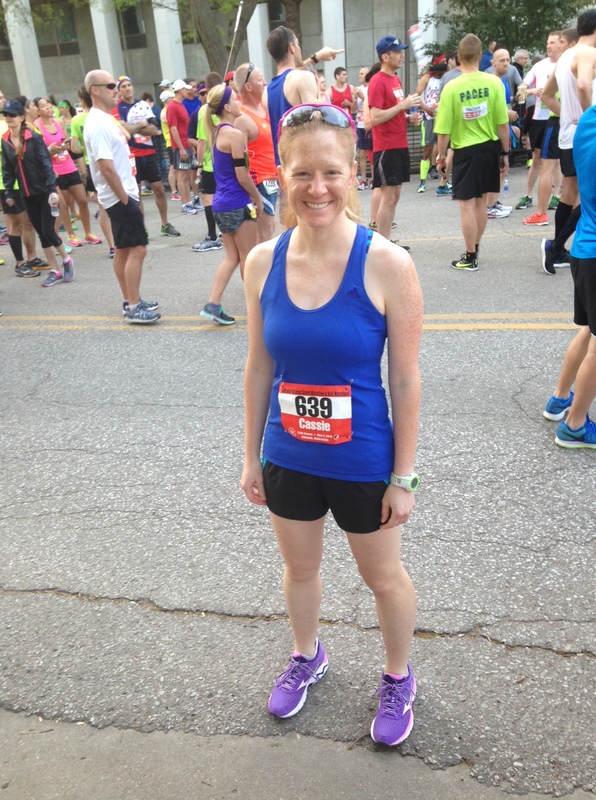 I felt better about my finish when I got the official results e-mail Sunday night: I crossed the start line 133rd overall, 15th woman, and 5th in my age group, and I crossed the finish 130th/16th/6th. So yes, I struggled, but so did everyone else. Later, I read that the men’s winner — who also won last year — ran 10 minutes slower than he did in 2014. So yeah, the conditions were tough. I wasn’t just a wimp. I was impressed with the race as a whole and would definitely run it again. It was extremely well-organized, and the volunteers and spectators were awesome. I also think it could be a PR course if the weather cooperated — it’s flat, but not painfully so , with just enough little rollers to keep it interesting. So what’s next? I’m not sure. I’d like to try again for 3:10… sometime, but not this fall. I don’t want to register for another goal race until my stomach stuff is straightened out, and with all our travelling and adventuring this summer, I don’t want to be committed to a hefty training schedule. For now, I’m going to recover, then run for fun and lift a little more weights. And then…. whatever I want, I guess! Anybody else race this weekend? How far off is your personal worst time from your personal best? Any suggestions for what my “next big thing” should be? Congrats on your finish! The warmer weather is making it hard for a lot of people to PR lately. At me recent 50 mile race, the heat was worse than the rain, thunder and mud all put together! I’d rather have heat than thunder and lightning! I’m so sorry you had a terrible race, but I love how you are handling it! I completely understand how miserable the heat is. That is exactly what happened to me when I was on track for a major PR in the half until I had to walk or I would have literally passed out. You are an amazing runner! 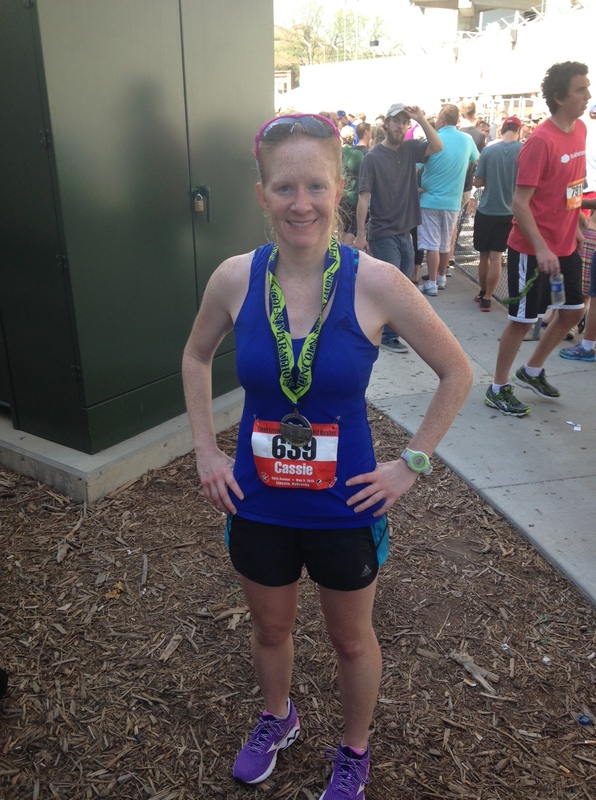 Congratulations on another marathon finish! Wow, it sounds like those were some REALLY tough conditions! I love what you wrote about the camaraderie of running and everyone looking out for each other – that’s exactly what I love about the sport too. I’m so sorry that you missed your goal but glad that seem you to be taking it well and really focusing on the positive. Congratulations on another marathon, even if it wasn’t the time you were hoping for. Still very proud of you! You inspire me all the time. Your next big thing should be hanging out with me! Yes. We will do all the out-hanging. I’m incredibly impressed that you were able to run hard and finish strong in those terrible conditions. I’m so sorry that things worked out like that, I know it must be disappointing! Thanks! I am disappointed, but what can you do. Sounds like you were at least above 70, and for that you did an impressive run. That makes me feel a ton better! Thanks so much for sharing! Although it would have been awesome to meet you, I’m a little bit glad that it didn’t work out for us to come to Lincoln. That sounds just brutal! Way to power through! Yeah, it sounds like the race you did was way better!